D.C.'s biggest developer is transforming abandoned buildings, construction sites and government offices into works of art, one paint can at a time. Why is a 1,300-pound moon hanging over Nationals Park? WASHINGTON — Brian Coulter is the most powerful man in Washington. On any given night, he can change the color of the moon with the touch of his finger. Well, at least the moon that hangs over Nationals Park. “Sometimes people are at the game and they will call me or text me and say, ‘Hey, can you change the color of the moon?’ It makes them popular with their friends,” said Coulter, a managing partner at The JBG Companies, one of the region’s largest real estate development firms. The 10-foot-tall, 1,300-pound moon that hangs from a crane above JBG’s 1244 South Capitol St. construction site is the latest addition in the firm’s ongoing effort to incorporate art in its projects. Two years ago, JBG launched a mural initiative. The company commissions local and national artists to breathe creativity and color into some unsuspecting places — like parking garages, building corners and even sidewalk walls. So far, it’s put up 25 murals throughout the DMV, and has plans to complete five more this summer. The point of the murals is to spark intrigue and interest in the building or neighborhood. “How can we really reinvigorate and make some of these places more interesting than they already are?” said Coulter about the idea behind the project. Australian artist James Reka transformed L’Enfant Plaza’s concrete landscape into a public museum with his painting along a staircase, and D.C.-based No Kings Collective enlivened the entrance to the parking garage at JBG’s Atlantic Plumbing. Even the walls at the National Cancer Institute and the National Institute of Allergy and Infectious Diseases have been touched by artists. “It could be a boring, monochromatic-painted cinder block wall, or it could be something that’s much more interesting,” said JBG Senior Vice President Matt Blocher. “The idea is to do some fun things, and sometimes have people just step back and maybe scratch their heads and go, ‘What is that? Why did they do that?’’’ Coulter added. The point isn’t permanence. In fact, a lot of the art marks forthcoming projects. Some murals have been painted on buildings that have since been demolished. 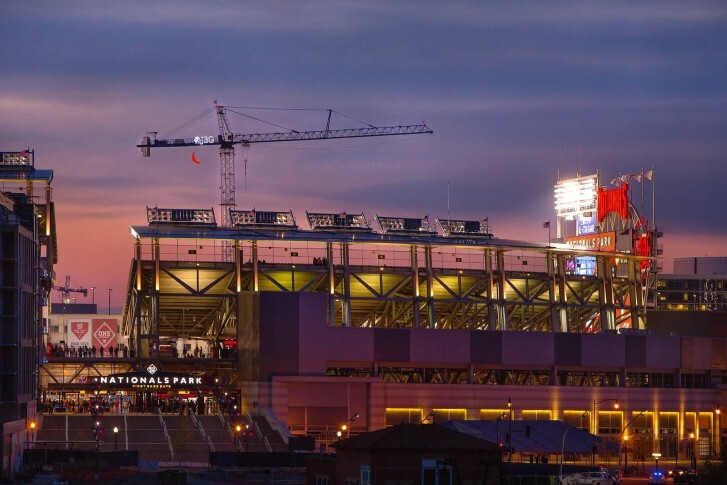 Over at Nationals Park, the moon will come down from the sky when the crane does. However, their temporary presence adds some allure to otherwise abandoned buildings and vacant lots filled with equipment. “Given the nature of construction, it’s not uncommon for a project to take two to three years … and usually there’s a big chain-link fence put up and people are told to stay away. And we thought that’s not a very welcoming thing to do in whatever neighborhood we’re in, so maybe there are some things we can do to really sort of beautify what’s going on during the construction time period,” Coulter said. JBG has even collaborated with artists to improve the typical logo-bearing windscreens that line the perimeter of a construction site. “We don’t want people coming into the sites, but it could be nicer when you’re walking by them,” Coulter said. The more imaginative signage also helps the developer tease the future retail or residential concept and gives the community a sense of what’s coming in. Coulter admits that he wasn’t sure how successful the project would be when it kicked off in 2014 — “You start talking about doing murals and people start thinking of doing graffiti and tagging,” he said. But handing over the creative reigns to artists has helped to engage the local community and make several uninspired urban spaces more compelling. “I think a lot of people felt like they were part of the whole project because they were there watching it as it was being painted,” Blocher said. And while the colors and concepts of JBG’s murals belong to the individual artists, the Nationals Park moon, which went up in time for Opening Day, was all Coulter’s idea. The inspiration came from a giant moon he spotted at an outdoor opera in Italy. Instantly, he imagined it on one of his cranes. “At nighttime, it sort of brings these not-so-great-looking big objects that are temporary in the sky, it makes them a little bit more fun and interesting to look at,” said Coulter, who controls the moon’s color from an app on his phone. Follow @WTOP on Twitter and like us on Facebook. © 2016 WTOP. All Rights Reserved.